Laminate Flooring Core Density will be either HDF – High Density Fiberboard or MDF – Medium Density Fiberboard. The core layer is the central board upon which the other laminate layers are attached. The fiberboard core is made of highly compacted wood fibers that are bonded with resins. The core board is designed to support the weight and stress put onto the laminate by foot traffic. The higher laminate flooring core density is HDF,which will make a better laminate flooring core. HDF is high density board and has more strength compared to MDF and Particle board. MDF – Medium Density Fiberboard is an engineered wood product consisting of cellulose fibers in the form of fine wood chips and a synthetic resin or other suitable glue. The mixture is bonded together under heat and pressure. The laminate flooring core density will be between 38 lbs/cubic foot and 48 lbs/cubic foot. 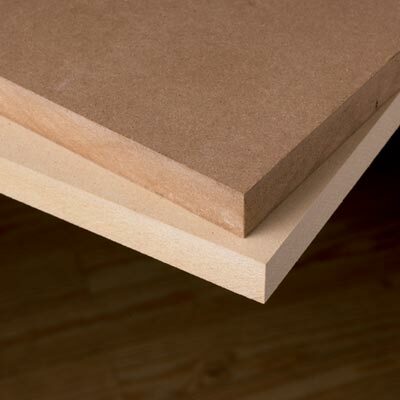 HDF – High Density Fiberboard is produced the same way as MDF, but higher pressure is applied. This higher pressure results in a laminate floor core density of HDF in the range of 49 lbs/cubic foot to 60 lbs/cubic foot. Moisture resistance of HDF is achieved during the manufacturing process by adding wax or other water repellent materials. While some people refer to the core of laminate as particleboard, particleboard is not used as a laminate core. Like MDF/HDF, particleboard is manufactured by compressing wood particles that are mixed with binding agent then formed into a sheet. The raw material for particleboard is any low-cost wood species, both softwood and hardwood. There are particleboards of very low (350-450 kg/m³), low (450-650 kg/m³), average (650-750 kg/m³) and high (700-800 kg/m³) density with one, three and five layers.